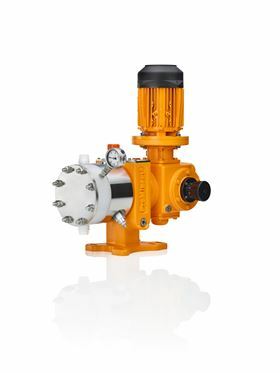 ProMinent will be showcasing its Orlita Evolution EF2a plunger metering pump at this year’s Pumps & Valves trade fair. ProMinent will be focusing on the design features of its Orlita Evolution EF2a plunger metering pump at this year’s Pumps & Valves trade fair in Dortmund, Germany. The trade fair takes place between 20-21 February and ProMinent will demonstrate technical details using a sectional model of the Orlita Evolution EF2a. The company says that the Orlita Evolution EP1a and EP2a make precise pump capacities possible even at very high pressure levels and temperatures of up to +200 °C. All Evolution variants with stainless steel and plastic metering units and those with piston dosing heads are produced from modules so can be designed as single and multiple pump versions. Up to four metering units, with varying pump capacities, can be combined in multiple pump systems. The power ends can be arranged in any position, either vertical or horizontal and there are seven different gear reductions. The Orlita Evolution model has a PTFE multi-layer diaphragm with integral diaphragm rupture warning system and diaphragm position control. All pumps are designed to comply with API 675 and can be used in Zone 1 and Zone 2 areas at risk from explosion with ATEX certification. The ProMinent team will be at Stand R 51-6 in Hall 6 at the Pumps & Valves trade fair.